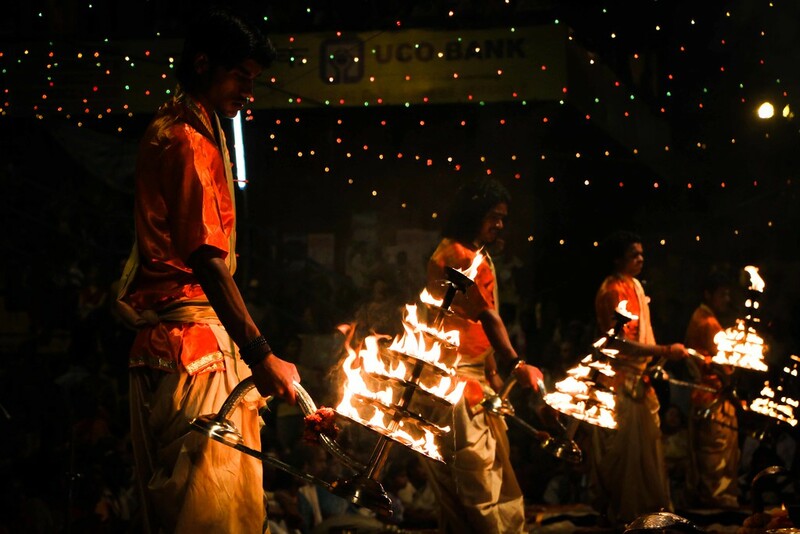 The Puja ceremony is a Hindu ritual full of colour, smoke and fire, and takes place on the banks of the river Ganges. 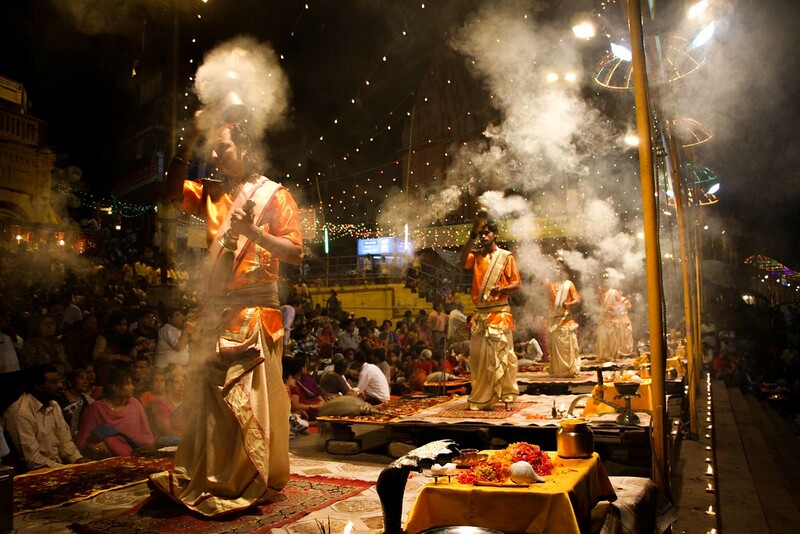 It was by far one of the highlights of our time in Varanasi. 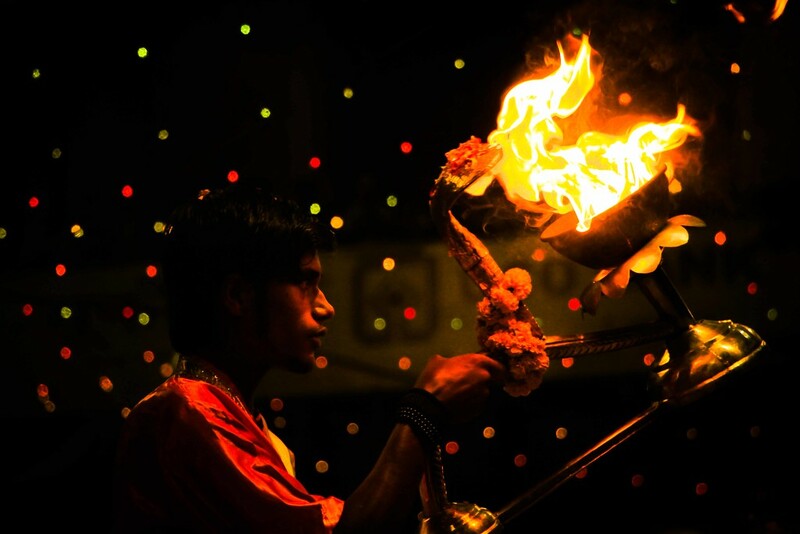 Whilst the Puja ceremony may have made the highlights list on its own merit, there is another reason why it was one of my most favourite experiences in Varanasi. One quick photo with some new friends descended quickly into a quite frankly ridiculous impromptu photoshoot, with a queue of women and babies stretching out into the darkness, all keen for a photo with yours truly. It began, as with most things in India, with a smile and a slight wobble of the head. 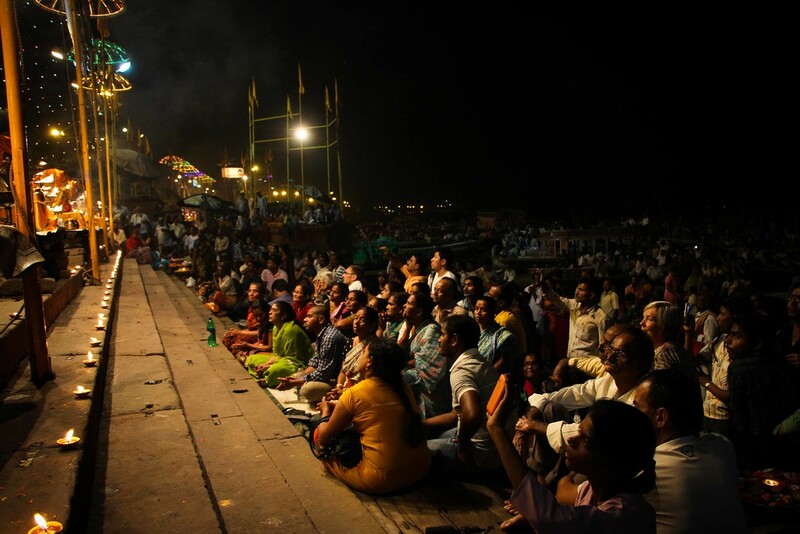 We’d seen the Puja ceremony the night before from the river Ganges, on a small boat as it gently bobbed on the river, and although it was a fantastic spectacle to witness, it had left me wanting more. I wanted to get closer and be right at the heart of it to appreciate it fully. I arrived early the next night and picked my spot, to the right of the final podium and just below it. Before long many more people began gathering, taking seats and crates behind the plinths, and the boats began arriving as we had experienced the night before. 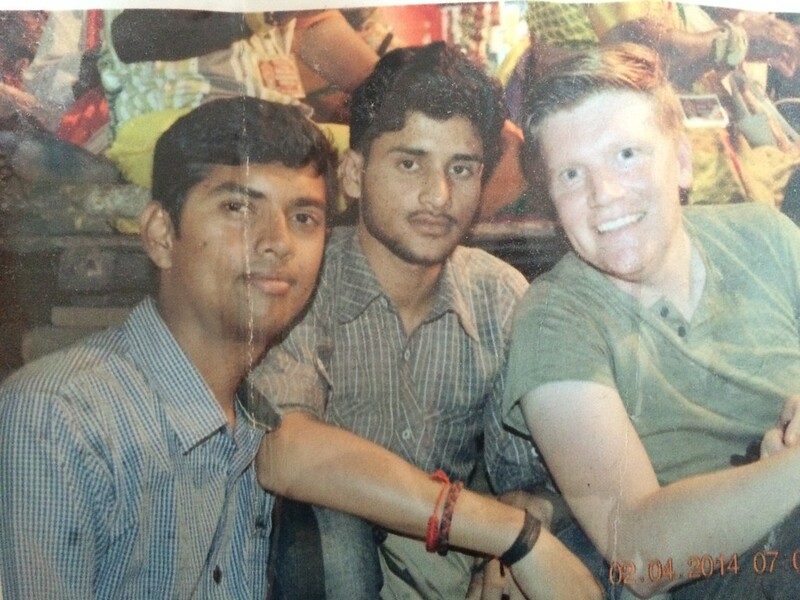 It was at this point that three young guys sat down next to me, and in broken English, began the usual series of questions I’d come to expect from locals in India. The questions spilled out of the mouths of my new friends in rapid succession, barely giving me a chance to respond and certainly no time to elaborate. Such was the way with many of the new friends we made in India, their line of questioning was inquisitive, friendly and direct. After a while, the conversation turned to that universal language I share with all males (and some females) across the world: football (or soccer if you must use the incorrect term). Note: There wasn’t a spare copy of the photo, but luckily I managed to get this rough photo of the photo for keepsake. Almost instantly after the first photo had been taken, a young boy had clambered over the people in front of me, stood next to me, and motioned to his father down near the water. Oh, I see, I’m getting a photo with you as well. Sure no problem. I sat back down, thinking that might be the end of it. Out of the corner of my eye to my right, a woman had manoeuvred herself next to my friends, and was holding out her tiny newborn baby for me to hold. I smiled and shook my head (I’m not very good at holding babies), she did the Indian head wobble and smiled, I did the wobble back and all of a sudden I had a baby in my hand. I stood up with the lady and had my photo taken, and all of a sudden I realised that there was a queue of people now lining up to have their photo with me, stretched out into the darkness. Many with babies and young children. I was being papped India style. Sadly I don’t have a copy of any of the photos myself, but I assume there are quite a number of me adorned on the walls of various family homes in India. Perhaps I’m some sort of celebrity now, who knows. I couldn’t help but smile at the scene. People were quite literally queueing up to have their photo taken with me. Where would these photos end up? Pride of place on a mantlepiece? Hanging above a fireplace? I had no idea, but I was a fair target. 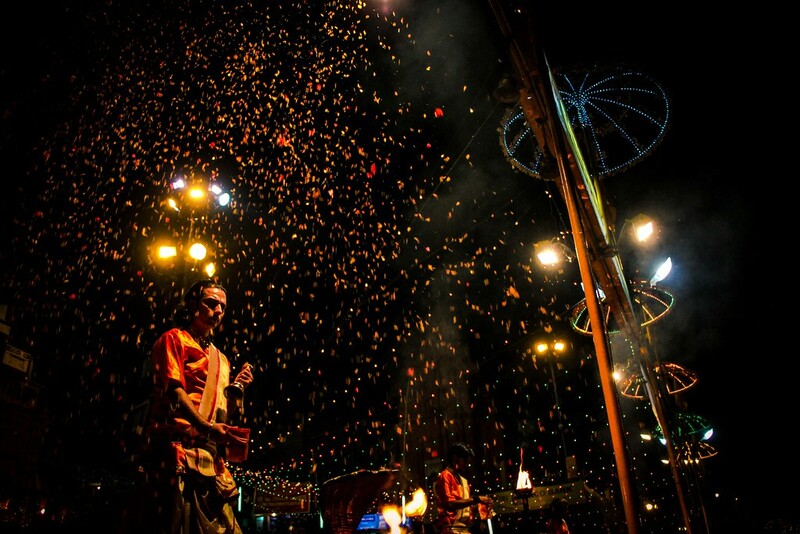 Secretly I was enjoying the spectacle, it was moments like these that make travelling the world special. After about 10 minutes of this, I realised the crowd were getting restless. The Puja ceremony had begun already, and due to my impromptu photoshoot, their view was obscured because a) I was standing up, and b) the queue of people lining up to have their photo taken. It was surreal and hilarious, and I couldn’t help but grin at the situation as 1000 Indian eyes peered at me from out of the darkness. At this point I had to disappoint the remaining people in the queue and sat down, back in the safety of my new friends who had spent the whole time organising the queue and laughing at me. All they needed were some suits and shades and they would have been my entourage and bouncers. 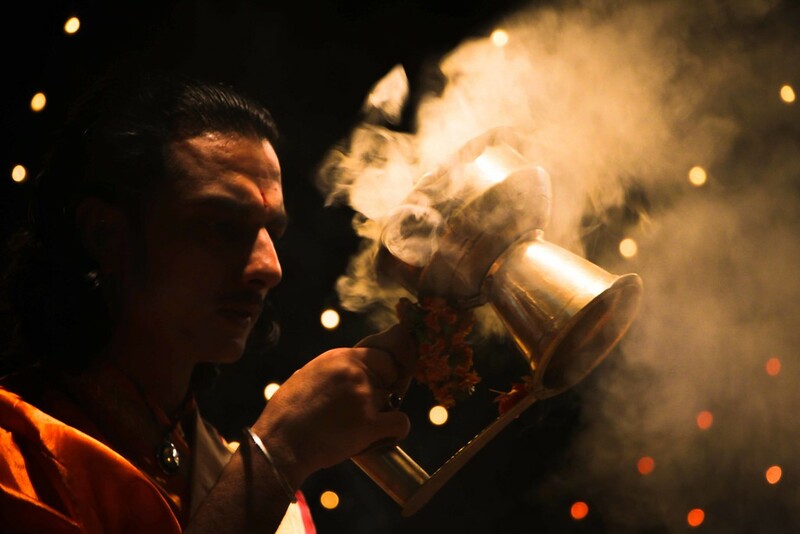 We watched the rest of the Puja ceremony in silence, and I beamed from the inside at what had just happened. 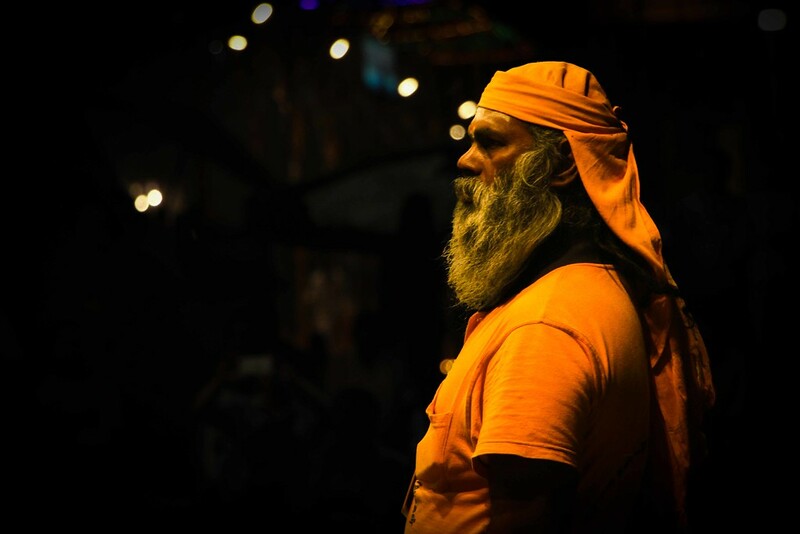 I had come to watch the Puja ceremony, but as with most things about travel, it was the people whom I had met that had made it a special memory I would never forget. India is an attack on the senses. It can be brash and direct and uncompromising, but if you can find a way to cope with that, you will be rewarded with interactions with people full of warmth, energy and intrigue. 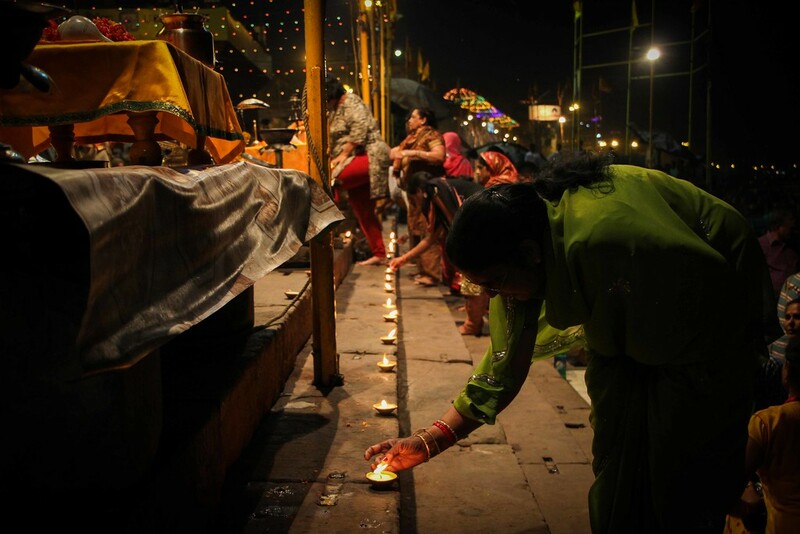 As I walked back to my guesthouse along the orange lit banks of the Ganges, I reflected on how I had probably made their night memorable, as they had for me as well. It was nights like these that reaffirmed why we travel. 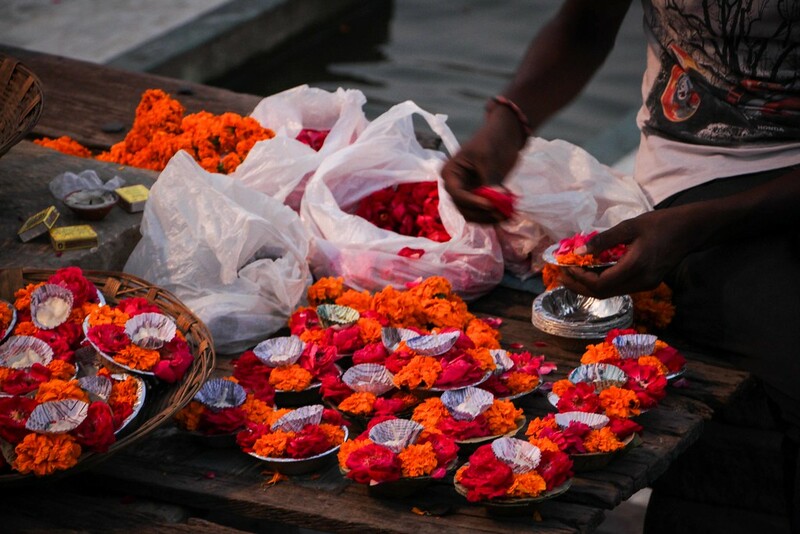 Looking for more India inspiration? Click here.